Fitted with the same tiller control as the agile Tug Classic, the operator walks in front of the heavy load allowing maximum forward vision and eliminating the possibility of accidents when negotiating turns. 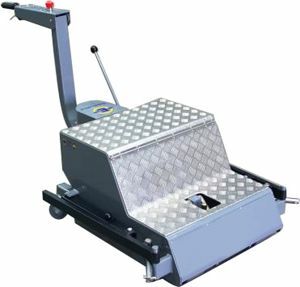 The Tug Tough converts a difficult and often dangerous operation into an easy to move motorised assembly. Built with heavy industrial applications in mind, the air plane tug utilises a powerful 48V drive system to allow a single operator to hitch to and move big loads. It is available in two capacities, 5 and 10 tonne, with an optional hydraulic lifting hitch available for either capacity. The air plane tug includes the latest developments in Australian made D.C. geared motors, a high capacity programmable controller, forward and reverse drive controls, variable speed control, automatic electromagnetic park brakes and emergency brake release. Tug Tough comes with a comprehensive 12 month warranty, including parts and labour.